Did Muhammad Forbid Privacy to Non-Muslims? Shock waves of indignation ran across the Muslim world following the recent publication of offensive and crude caricatures of the Holy Prophet Muhammad (may peace and blessings of Allah be upon him) in some parts of Europe. The un-informed, as ever, misled by the mullah gave in to public display of rage and rampant chaos ensued. Midst this confusion of an undeniably distressing time for all Muslims, spoke the voice of reason, calm and peace, precisely in line with the teachings of the ‘prince of peace’ himself, the Holy Prophet (may peace and blessings of Allah be upon him). This was the voice of Hazrat Khalifatul Masih V (may Allah be his Helper) that unfolded the reality of the Islamic ways and means to respond to injustice; calling for peace, reasoning, endeavour to enlighten the world with the power of the pen and ultimately to always put one’s trust in sincere prayers. He delivered a series of five faith-inspiring and enlightening Friday Sermons on the subject that are a beckon of light for anyone in this often perplexing world that we live in. 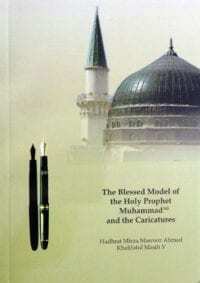 These Friday Sermons are being presented in this booklet.